This May, we are excited to feature five lovely couples who have allowed us to fulfill their papered dreams. We hope each of these couples’ designs may inspire you just as they have inspired us. Amy and Greg were joined in Holy Matrimony last weekend and we know that their wedding was as fabulous as they are. The Ritz-Carlton was glowing with purple and platinum and their love surely added just the right amount of sparkle. Their wedding monogram is modern, simple, and elegant. 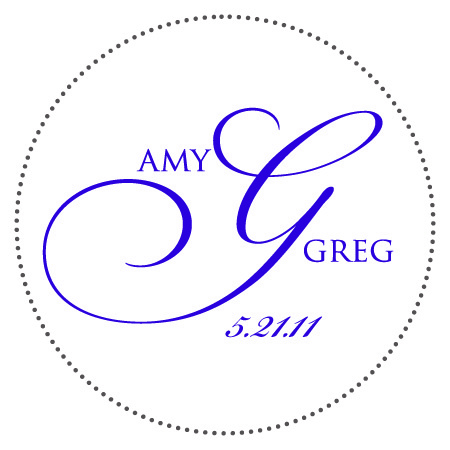 It showcases that while Amy and Greg are individuals, together they are stronger and much more prominent. Amy’s stationery included a 5×5 pocketfold for their wedding invitation and their wedding day stationery included a slender and sleek program design. We were blessed to share in this papered journey with Amy and Greg and it is our prayer that their marriage is forever blessed with love, joy, and peace. We look forward to sharing photos of their beautiful stationery soon.